Lucy is a native of Chihuaha, México and now lives in Philadelphia with her family. She is an active member of Visitation Parish in North Philadelphia. Her participation in NSM began when she needed help with a personal case and was surprised to find the services and support she needed. She joined the NSM board because she believes that it is important to participate and contribute in both large and small ways to the work for immigrant rights in the US. She also finds the work to be interesting and engaging. While NSM needs people “in the street,” she identifies her role as being behind the scenes: helping to inform and support people quietly and consistently. She knows that her ability to connect with neighbors and share relevant information related to immigration issues is vital to her community. Her belief in God tells her that it is right to put things in God’s hands: whether good or bad, God has a reason and a plan. Her message to the public is: I know that things can be difficult, but remember that you are not alone. Do not fear! There is a community of support for you at NSM. Heather is a member of Tabernacle United Church in West Philadelphia, a NSM member congregation. She is a native of Georgia, and lived and worked at the Open Door Community, a Christian community of radical hospitality and activism in Atlanta. In the late 1990s, Heather lived and worked in Mexico, where she witnessed the flow of migrants to the North in the wake of NAFTA. In 2000, she returned to the U.S., committed to working for hospitality and justice for immigrants in this country, after watching their home communities be economically devastated by U.S. driven policies. She is honored to be part of supporting the work of NSM where the values of welcoming the stranger and justice for the oppressed are central. Originally from south central Pennsylvania, Jessica began working with social justice working in Honduras in 1999. 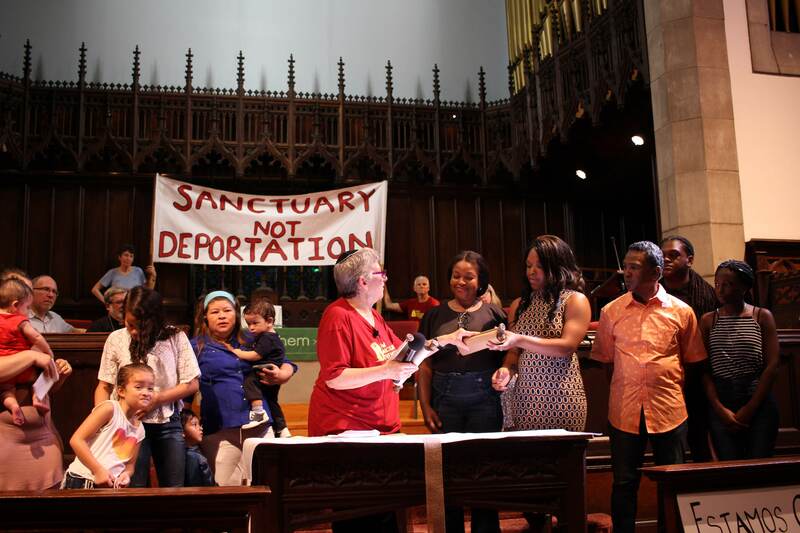 Since then, she has worked with CATA – The Farmworkers’ Support Committee, as a community organizer, and lived in Philadelphia for the past 10 years. She is a member of Tabernacle United Church, a NSM member congregation, and a participant of the Romero Interfaith Center – a volunteer led effort that has sustained a sistering relationship with El Salvador for over 20 years. Jessica is excited to join the NSM Board to support the important and critical work that NSM is doing to support immigrant communities in Philadelphia and to build relationships of solidarity across the city. Chantelle Todman-Moore is originally from Miami, FL but has called Philly home for 11+ years. She attends Oxford Circle Mennonite Church, a NSM member congregation, where she serves as part of the pastoral support team. She first connected with NSM through several inspiring coffee dates with Blanca Pacheco while working in her previous role organizing and resourcing Anabaptist congregations in Philly. She joined the board because as a child of immigrants she grew up hearing about her family’s amazing and sometimes costly immigration journey and desires to be part of creating a world were all people are valued and welcomed across lines and borders. Gerardo Flores is from a small town called Tianguistengo, Acatlan de Osorio, Puebla, Mexico. He finished high school in agriculture and his dream was to enter Chapingo University. He passed the academic exam in 1975, but not the socioeconomic examination (requiring money and land) and they suspended me after that. He began to organize students in the Peasant Torch group to return to their villages to fight injustice and the exclusive control of power. The organization sent him to the US to Chicago in 1985 and then to New York and Philadelphia in 2006 to financially support the organization. Gerardo has been a member of NSM since the beginning, 10 years ago. During the day he owns his own food truck with his wife Teresa. Gerardo is a member of Visitacion BVM church. Estela Hernandez is Mexican from the Oaxacan coast, from Pinotepa Nacional. She learned about NSM during a prayer meeting to the Virgin of Guadalupe and was interested when they explained to me about my rights in the USA, since my family and I had already been discriminated several times by the police. Estela is part of the committee for the Virgin of Guadalupe at Visitation BVM church. She joined the Board because she wanted to learn more about how to support the broader immigrant community. As an inmigrant, she knows the needs of the community already, and believes if she can help move things forward, together we are stronger. At each step, each strategy, God goes first, and believes we must never lose our faith because faith moves mountains. Ana Ramos is originally from the Dominican Republic and has called Philadelphia home for over 20 years. She first heard of NSM through her role as a volunteer and activist in immigrant’s rights organizations in college. Ana decided to join the NSM board in 2019 because she wanted to take her activism to the next level by supporting the organization in a more systemic manner. In her professional life, Ana works with immigrant and minority business owners to support them with selling healthful foods and has experience in project management, grantwritting, staff supervision and project growth and sustainability. She also worked on a project to analyze the food environment in the Juarez/El Paso border and published a bilingual and binational report, a first in her organization. Ana brings lived experience as an immigrant as well as her professional experience to the NSM board and is excited to work with an organization that embodies her values of faith and community.